Black Lightning vol. 2 starring Black Lightning taking on the enemies of Brick City. 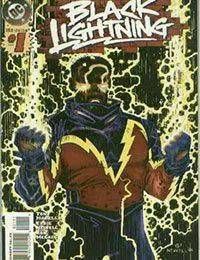 Writer Tony Isabella returned to his prized character, Black Lightning, in an ongoing series with artist Eddy Newell. Updating the classic 1970s hero and Outsiders Alumnus with a new costume, Isabella threw teacher/ hero Jefferson Pierce into the gritty new surroundings of Brick City, an area seemingly devoid of hope and in need of a guiding light. Black Lightning began to clean up the town with the help of familiar faces such as Gangbuster and later Batman himself. The comic was short lived and ended at issue # 13. However, Black Lightnings new costume went on to gain a bit of immortality in plastic as this series inspired Black Lightnings first action figure courtesy of the Kenner to company.